This spring, I went to do the intake interview with Melissa Spivack, a 47-year-old woman who is almost four years into her journey with ALS, amyotrophic lateral sclerosis, best known as Lou Gehrig’s disease. Her caregiver, David, led me to the brightly lit bedroom at the rear of the home. A rail had been installed in the hall ceiling, running from the bedroom to a nearby bathroom. I glanced inside as we passed and saw the rail terminated above the toilet. Clearly, great attention had been given to anticipating Melissa’s needs as this disease progresses. Melissa was comfortably settled on a wide hospital bed, working at her computer. She was controlling the computer cursor by means of a device attached to her eyeglass frames, selecting each letter and/or word that appeared on the screen as she slowly expressed herself. 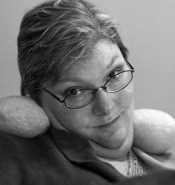 Before diagnosis with ALS, Melissa worked in business and occasionally traveled internationally. When the definitive diagnosis was given, she went into action. She hired David and arranged for retrofitting of her home. While contractors installed an elevator, created an apartment for David, outfitted the bathroom with a shower chair and special toilet and installed the railing in the ceiling, she and David traveled to the Boston area and stayed with her family for three months. Upon returning, her San Franccisco home was ready for the next stage of her journey. Melissa is lying motionless in a hospital bed. Her life-experience is wide-ranging, her intelligence immediately impressive. Her writing style on the computer is precise and even slightly formal as she seeks out, then “types,” each letter. She talks about her daily struggles and decisions like the feeding tube. She has just begun to talk about death but moves away from the subject quickly. She knows she has a ways to go yet. Despite her enormous limitations, she remains in command of her world, with the exquisite help of her nursing assistant, David. This is a house filled with love, especially the profound intimacy shared by Melissa and David, who regard each other as the love of their lives, and speak of each other as spouses. They share a kind of telepathic bond, which allows David to sense her needs intuitively despite her inability to speak. David cares for Melissa with deep devotion and she has opened her heart to him fully. In the midst of this catastrophic illness, there is unexpected love. Each day they live simply together, performing the endless rituals of Melissaâ€™s bodily care. Each day they laugh together. Melissa is still engaged with her community and family. Recently, Curtis and I attended Melissa’s 47th birthday party, where the photo to the left was taken. Melissa, in her huge wheelchair, looked like a queen on her throne, receiving her subjects. The house was filled with friends and family, all of whom spend time with her regularly, as well as communicating by email. They were grateful for what the Living/Dying Project is offering, how our presence on the scene allows them to feel more at ease about Melissaâ€™s inner well-being. Dying is a profound inner journey, taken entirely alone, and yet being with Melissa is also a family journey. I’ve met Melissaâ€˜s mother and tasted her superb apple pie, and spent a long time talking with Melissa, her father and her stepmother, Marilyn. They long to talk about their feelings and worries with Melissa, and having a volunteer present helps to facilitate that. David is determined to sustain Melissa’s life and has the conviction that he can do this by the power of his love. Even in the midst of death, he keeps them both turned toward life through this love. I made a decision to tell people my news soon after diagnosis. I wrote to groups who knew me from a common context. My goal was to make the unspeakable approachable. I had zero understanding of ALS. I read all the information and it felt like something that was happening to me even as it was. It’s not that I was in denial. I kept adapting. But I still didn’t know what it would feel like to be so completely dependent. I believe that because of my relationship with David, not only have I lived longer, but he keeps me engaged. He’s also incredibly annoying at times! The hard part is clearly in front of me. There are times when I am deeply depressed. I am on a lot of antidepressants. I want to feel like I want to get up in the morning, but I want to feel the process too. You and Lyn have been amazing. I am beginning to feel I have a safe place, without everyone else’s agendas, to talk about choosing death. I said earlier that I didn’t understand what ALS meant for living. I have always known I would have to choose how and when I die. Melissa noted how her outlook on life changed for the better during her journey with ALS and that fact was bewildering for her friends. Yet those close enough to observe how her heart has opened surely recognize the gift that has come to her. Melissa expressed her fears, in part about where this is going for her, but also her concern for David, whom she will be leaving. As always, my approach is to support and encourage the person to remain open to what arises moment-to-moment along the journey. Certainly no one would wish upon themselves or someone whom they love a journey as harrowing as that taken by those with ALS. But if one must take this journey, it is grace when one is able to open oneâ€™s heart along the way. Melissa shows us it is possible to do. is to pray as if God were not present.